Deluxe metal crown with colored rhinestone gems and foam inner liner for a snug and comfortable fit. 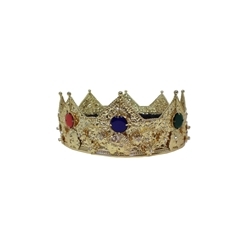 This crown is available in gold or gunmetal and measures 3” tall. The gold crown is available in size medium or large and the gunmetal crown is available in size large only. Size medium fits up to a 22.5” head measurement and size large fits up to a 23.5” head measurement. This crown is the perfect crown for royal kings, homecoming kings, or prom kings. Please note that the shape and colors of the stones may vary. I ordered this crown for my wedding (September 15, 2012) and chose it because it was the only crown I could find large enough for my head. The quality is great and has a nice weight to it.